The IBASE MRS-800 is a cost efficient RISC-based touch panel PC system based on the Cortex-A8 600MHz microprocessor, TI AM3517. Supporting 3D graphics acceleration, it is suited for a diverse range of applications including industrial and home automation, POS terminal and kiosk panel. It is a rugged, compact system that has low power consumption and fanless design. The MRS-800 offers 256MB of DDR2 memory and onboard 512MB NAND flash/SD card for storage. It has the necessary interfaces required for many applications: 1x 10/100 Ethernet with optional PoE support, 1x USB, 1x RS-232, 1x SD card slot and a 12V DC-in jack. It has a programmable LED light bar and supports USB OTG (USB On-The-Go). 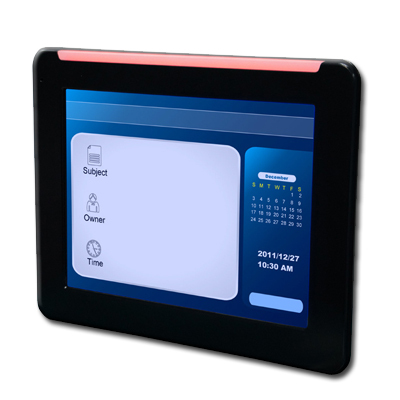 The MRS-800 resistive touch panel PC comes with a black plastic enclosure with an 8.4-inch TFT display featuring 800x600 resolution. It can be quickly and easily integrated with its VESA mount support (75mmx75mm). The stand-alone device supports high-level operating systems such as Linux 2.6.x, Windows CE 6.0 and Android 2.3. See the Product PDF Datasheet for Full Specifications.